Adding a new line of product–Advanced Student Violins. 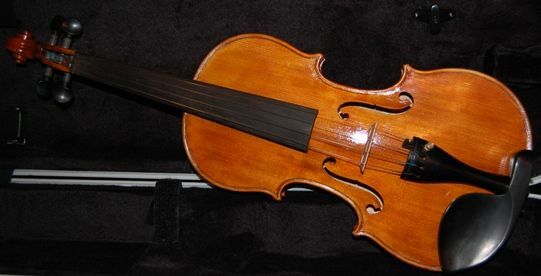 I have decided to add a new line of violins: affordable to advanced students, but still very high-quality instruments. These instruments were built by me, but not from raw materials; rather from pre-machined parts (CNC-cut) bought elsewhere. 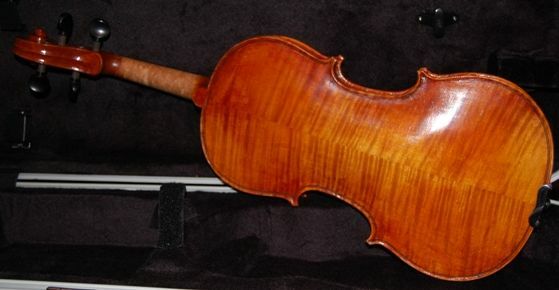 I do not sell these as signed and numbered luthier-made violins, because I am not the one who (completely) made them. I only completed the job; installed purfling, corrected arching, graduated the plates as needed, installed and trimmed the bass-bar to my standard, set the neck, installed the end-pin, saddle, fingerboard, nut, pegs, etc., and finally, after careful assembly, varnished with the same care that I use on my handmade instruments. I provide the same guarantee and return policy on these instruments as for my handmade instruments. I will, of course, continue to offer my own handmade violins, violas, cellos, double basses and five-string fiddles, as always. (a) Not everyone can afford a luthier-made instrument, especially when they are just starting out. (b) Buying the materials in pre-machined form reduces my labor significantly, so I can charge a great deal less, while my customers still get a very good instrument, whose final character actually is determined by me, and is personally attended to by me…not like a factory instrument. (c) I can meet a known need much more quickly, so that the wait is less frustrating for the customer, when an instrument is ordered. For the moment I am only offering 4/4 violins, but I may extend the selection later. I am even considering learning to machine the parts myself, which would, of course, also involve buying the necessary tooling, but which might keep the price low indefinitely, and allow me to offer a full- range of instruments in the advanced student price-range. It would also mean that ALL the labor would once again be mine, even though I would be using a machine to do all the rough work. I will label any such instruments as “shop-made” instruments, with the “West Wind Strings” workshop label, as my house-brand instruments. They will enjoy the same 100% trade-in policy as my handmade instruments, but there will not be any confusion as to which is which. Here are two finished violins which are currently available. If they sell quickly, I will put more up immediately, as quickly as I can complete them. (see Photos below:) Both have pretty amazing tone, I must say. I was not really sure what to expect, as I have never before built from CNC carved parts. I am very pleased with the results. Chez Les Eveques from Chester O. Bishop on Vimeo. If you are interested in either of these violins, or others like them, please contact me and we can arrange to get one into your hands for a trial.